E. J. PACE...was a great read! Very meticulously detailed and interesting. One of my favorite parts was the snowflake design info. That was cool! I've already lent the book out to some friends. ) ...His cartoons are great! I wish artists these days would have enough guts to present the Truth---like he did. God used this man in mighty ways... R. F.
It is sure a blessing... Thank you for E. J. PACE. Surely, the Lord blessed this man to become a living Christian example for many. Even for me. Z. B.
Jack Chick telephoned, saying of E. J. 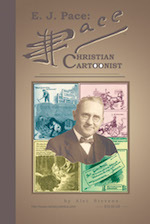 Pace: Christian Cartoonist, It's a masterpiece! I'm having a feast; I can't stop reading it. Of Dr. Pace he said, I'd never heard of him, but I'm sort of in my own little world out here. Pace was ahead of all of us; he was there first with a bold message (preaching the Gospel, as well as exposing Islam, Roman Catholicism, Christian Science, etc. for what they are). 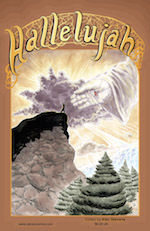 Beloved brother in Christ...I just finished Hallelujah, and I wanted to let you know it gave me great joy reading it... I look forward to my next adventure in Christ! May God continue to bless you in your next book! J.B.
Hi, Alec! I received the copy of Hallelujah in the mail! Wow, it looks great! Many thanks and I pray these stories go a long way hitting their mark and drawing people to Christ! A.C. I can't wait to get mine. 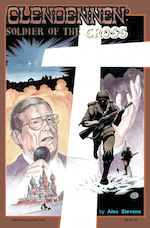 No kidding...this is probably the coolest Christian comic of all time. Alec did an outstanding job pulling all these stories and all this talent together. Thing is, it needs to be a monthly with ongoing, similarly outstanding material, as if some real company were producing it. (Not to say you couldn't, Alec. You, of course, would be the head of said company). H.J. It looks like some great stories, and a good mix of Bible and stories of faith. Thanks for sharing... E.G. Wow, I only saw this...right now. Wonderful news! I cant wait to order your new book. 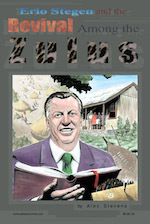 But I need a day or two because I also want to order a few more Revival Among the Zulus books for the Mission. ...Congratulations about your new book! I am glad you did (a bio of) Jan Hus! I really can't wait to have it. C.N. ...Congratulations and blessings for the publishing! J.D. That looks fantastic, Alec! Very exciting. Interestingly...I was talking to a graphic designer today about your work, and she asked that I send her your link so I was thrilled to be able to (do so)... D.S. It seems that God is sending you the 'muse' to write and write more..... Congratulations for the new book. Went through the pages and it is very nice. V.M. That's awesome, Alec! That must have taken you a while! You should be proud! M.K. ...I've been to your site, and your work is really amazing! E.S. This looks awesome, Alec! I remember you telling me that you would like to collect all 2 (3) issues into one anthology! I would like to order one copy. Also, I would like to order another E.J. Pace book, too. (Both signed, please). R.F. Congrats on the book; sounds like a really solid project. M.L. That's fantastic, Alec! All glory to God. Thanks for sharing. M.D. Got your book! Looks great. Haven't had the time to read through it yet. ...Exciting to see your collaborators! I'm a big fan of Scott McDaniel and Lee Weeks. A.C.
...Would you be interested in having this on the iPhone as a book? Let me know; I can help put it up. J.G. Really cool! I will probably order one through Paypal. Glad to hear people are ordering. Thanks for letting me know! I want to pick one of these up when it's ready! A.S.
Congratulations, Alec! If I'm not mistaken, 100 pages means there's material in this book that was not in the original two comics. Knowing the level of craftsmanship that went into them, I'm looking forward to seeing your latest collection... C.B. There are so many wonderful stories in Glory to God. The personal testimony of Steven Sebyala is very good. It seemed that I had read this testimony somewhere before. Truly it is amazing, the love of the Lord for His children how He keeps us when we're in danger and how he takes our experiences and uses them for His glory. Did you meet this gentleman? His life inspires others to be that Vessel of Honor for the Lord. The Christmas Gift was another beautiful story. She gave her all to Christ and it cost her everything, and yet for her it was a small price to pay. If we could learn to give Christ everything, wouldn't our lives be more victorious? The one with the School of Christ International as I was reading it, I could hear Pete Spackman giving this testimony; I could hear Bro. Clendennen give the testimony as on this page. Bro. Darrell Turner I know also, and I love to hear him minister. Very good. I did like D.L. Moody's story. ...To know that he led more than one million souls to Christ is awesome. I had also met Samuel Yun when I was in Northern Ireland in 2004 and was able to take a photo with him. ...To be able to memorize chapters of the Bible (as Yun did as an illiterate youth) is tremendous. I wish I had such a mind. I have a hard time sometimes remembering verses until the Lord brings them back to me. What an honor it is for us, (having men of God in our midst such) as Cesar Lubrin and Bro. Clendennen, and I have numerous that I could name and spend hours with... Truly it is Joy Unspeakable and Full of Glory. J.A. Thanks for...your new book. The artwork looks great. It looks like it's all hand done with gouache possibly?! I hope that it will be used by the Lord to encourage the Christian and through it God might save the unregenerate sinner. J.B. Looking forward to reading this and sharing it with others. R.S. Praise God. Congrats on finishing and publishing. Praying it will reach many hearts. God bless, bro. K.M. Very powerful stuff. Can't wait to read the entire story. J.L. 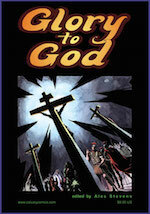 I'm very glad to see you are still working on these Christian Graphic novels! You are building quite an awesome collection of Christian stories. I purchased a copy of this one immediately. Mr. Clendennen has a great testimony. I especially love page 32! The layout, symbolism and the message are very powerful and come together beautifully to depict this pivotal moment in his life. That statement in the middle of the page stopped me in my tracks 'Everything that lives in the sight of our Heavenly Father is going to pass through a series of deaths and resurrections until there is nothing left but God.' God has recently impressed upon me the need to refocus my artistic passions toward the Scriptures... K.V. This one is very powerfully done and pray that it will reach many people. C.S. It is wonderfully illustrated... Can I tell you I am so excited! J.A. I thank God for people like you who know their gift and use it to bless the body of Christ. The Clendennen comic blessed and inspired me and because i m a visual learner God was able to reach and teach me through the images and personal testimony. Again, I want to thank you for blessing my socks off! M.M. A telephone message Alec, This is Jack Chick calling. I just read the Clendennen story this morning. Beautifully done, brother! Very exciting, very dramatic, and it really held my interest. You're going to really touch a lot of hearts with this one. God bless you for your faithfulness, brother! You're doing a great work. ...Love you, bye-bye. I have read the excerpt of the Sundar Singh comic and thought you have done an excellent job. It was very inspiring, much like the life of Paul. I can honestly say that I really like your style of art execution as well. Take care and God bless. 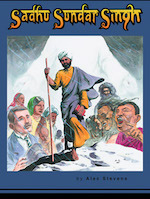 R. T.
Last night I read your Sadhu Sundar Singh graphic novel. You did an excellent job on it. Singh has a fascinating story. I do pray that this book will be read by many and that the Holy Spirit will use it to accomplish His purposes through it. Thanks, Alec, for persevering in this project. God bless you greatly, D. E.
A friend of mine had emailed me your website of Sadhu Sundar Singh. Just wanted to let you know how blessed I was by it. It is wonderful how the Lord has used your comics to reach youth. May God Bless you as you continue to use your talent for the Lord. J. A. The comic is looking great. I will definitely order some off you once things settle here a little. I would love my wee niece to read it. What will your next project be? I pray that Christ will really use Singh's testimony to really touch and change hearts and the the Holy Ghost will continue to stir and inspire your heart, above all drawing you ever deeper into Himself. God Bless, K. M.
Thank you for the graphic novel. I have been BLESSED by your rendition of his life story and it really challenges you to examine your own walk with Jesus. Well done. I logged on to the Calvary Comics sight and it looks pretty good. Do you have any plans to publish stories of people like David Brainerd, John Hyde, Andrew Murray, Richard Baxter, Keith Green, etc.? It would be great to read about them in your unique style. C. A. To God be the glory. There is a hunger out there for truth and from the great and positive response of your book, it is further proven. The Lord is definitely using this book to reach the Asian community, especially India. Thank you for sharing the response with me and I am very happy and delighted that it is doing so well. I know the Lord will continue to lead and guide you. J. N.
I just finished your graphic novel on Friday. You did a commendable job in telling Sundar Singh's story an a relatively brief amount of space. The artwork was solid and storytelling was clear (not that I would have expected anything other from you). Excellent work all around. If anyone on this list hasn't ordered a copy yet, they are missing out. B. R.
I dug the book! It's amazing how God can reach even the parts of the Earth that we might think are the farthest from Him. Wonderful book! S. M.
I received the book. Thank you! It literally floored me. An absolutely amazing story. Enlightening, enriching, and encouraging. How did you do the book - was it done with watercolors? It has this really neat look and feel. I absolutely loved it. The man in the mountains - 300 years old? Wow. Where would I find more information about that character? Thank you again. Sincerely, M.M. The book was great. I've read the story of Sadhu Sundar Singh, and was telling my sister-in-law about him. She is Indian, as is my husband. He is a Christian, but the rest of his family are Sikh. I witnessed to her and was telling her the story of him because they are also from the Punjab. I was actually hoping that the comics were in Punjabi, but she speaks English and can read it, having lived in England for 30 years. Since they were in English, I could enjoy it, too. I look forward to sharing copies with my Indian relatives. I did find a Punjabi book about Sadhu Sundar Singh which I took to India 2 years ago and left with my husband's aunt. I hope that God will use it to touch people and bring them to Him. The were so religious and seeking to honor God, but it broke my heart that they don't know the truth about Jesus. ....May God bless you and your ministry. P.H. That excerpt shows Revival Among the Zulus to be beautifully done, which to anyone acquainted with your previous work is no surprise. I'll be ordering a couple of copies. I'd like to see more of such classics-style inspiring comics biographies of great achievers, whether in the spiritual or secular realms (scientists, medical researchers, etc.)... M.H. Looks good and gets straight to the point... Well done on getting them ready for sale. I always think it is an achievement worthy of note when a creator gets a publication out there. This is probably due to knowing what you have gone through to do it and realising that the subject matter is powerful and that it is a part of your mission. C.E. I love it, as I do all your work. I can't wait to get a copy... Thank you so much...!! I love the preview; thank you so much for using your gifts this way. It's such a tremendous blessing; I'm very excited to see it finally available... God bless! H.L. Looks great... I found it very interesting. ...I used to go to church with a South African man who as a boy was healed by Erlo (by God, actually) at one of those meetings in KwaSizabantu. He preached about that outpouring many times. His name is Fred, and I haven't seen him in several years. Anyway, the comic looks great. ...I look forward to seeing it in print. D.S. ...I enjoyed reading the website... I teach Sunday School and we have been studying on different missionaries, and I think this story would be great to share with my class. Also Sadhu Sundar Singh... I enjoy reading about men who gave their all to the furthering of the Gospel, and seeing Pentecost and revival come to the lands. It places a desire in your heart to see revival in our day, and we will... J.A. This book looks GREAT! I've forwarded this to (a friend)...to see if we can get some copies for Comic Con... F.R. The book looks fantastic... I will place an order for some of your new books. K.E. The new comic looks very nice... Keep up the great work! God bless you and your work. M.A. Cool comic book! Thank you for sharing. R.G. Thank you! It is a very nice job and I really enjoyed it. Congratulations! V.M. Thanks for the look! Your work is great! Your faith is great! You are a very special person for Christ! Life forever! D.C.
Looks nice. How are you getting it into the hands of readers? J.G. It looks GREAT! Congratulations with a wonderful tool of spreading the Good News and also to bring souls to Christ. I believe that the story of this revival will bless many, like it did many years in my life. H.B. Cool...! The preview looks awesome and I'll be sure to pick it up. Do you have a schedule for when you have new titles published? M.R. Congratulations with the book... Your art is beautiful as always. J.H. Glad to hear it is in print. Praying that the Lord will bless it greatly. K.M. Thank you! It looks good, by the way...it’s an interesting read! B.B. ...Looked at the pages you had posted - Awesome! Love the story and great job with the artwork... Keep it up as we all tell God's story together. A.A.
Great to see that you've gone to your own publishing D.C.
Just want to thank you for the GREAT effort to design and create the Revival Among the Zulus comic book of Uncle Erlo Stegen. I am living on the (KwaSizabantu) Mission and appreciate everything that helps to further the Gospel. May the Lord bless your hard work so that many souls may hear and change before it is too late… Thank you kindly and warm greetings in Him. S.L. ...I'm glad to see you continue to create. You have a really unique style and I like it a lot. I'll look into purchasing a copy or two when I find a little more time. M.M. Congrats on Revival Among the Zulus! Blessings in Christ... J.K. Thanks for giving me a peek. It looks good. In Christ alone... J.L. I am so happy to have found your work... I was also blessed by Erlo Stegen's testimony and I think what you are doing with it is wonderful. I hope this testimony will be opened up to many more people, especially youth, through the graphic novel. Thank you so much for your ministry and I hope that your talents multiply and continue to bless many brothers and sisters for His glory. Please keep me informed of any new work in the future. Love in Christ... I.K. I had never heard of Erlo Stegen before, but while I was reading it I was touched because we have been praying for revival, and in doing so I have experienced where the Lord was searching my heart and bringing to my spirit things that I had hidden and needed to repent over, or to ask forgiveness from others on, etc. And others have also been experiencing this. I was so encouraged that revival came to the Zulus and the pastor when they humbled themselves and cried out, Lord, it's all of You, not me. Truly the Lord knows when to send a word of confirmation to you, whether it be in a book, a verse, or what someone says. We have prayer meetings on Monday nights, and I am going to share Erlo Stegen's testimony with them Truly the only hope for America is a True Revival, and it must start in each individual. God Bless... J.A. I will be visiting Erlo Stegen and the brothers there in September. Great work on the graphic novel. G.G. The books look simply amazing, and effective. Truly readable format. Thanks. E.N. This email came in from someone in Romania who ordered the graphic novels I just finished reading the books, Alec. I know you have heard this a few thousands times, but it simply feels right to say it again you are so gifted! Sadhu Sundar Singh brought tears to my eyes and the Revival Among the Zulus book.... is such an overwhelming blessing, what can I possibly say to express my heart... Now I have to translate the books for all my friends. My spirit rejoices thinking of a brother like you, not just gifted but serving only the Lord with his gifts, despite the hardship of the narrowest of paths. I think of your reward from the King of Kings and again, I rejoice! Pressing on, C.N.